Gawk at enormous Victorian houses and get cozy in an Irish bar on this jaunt through the Bronx. 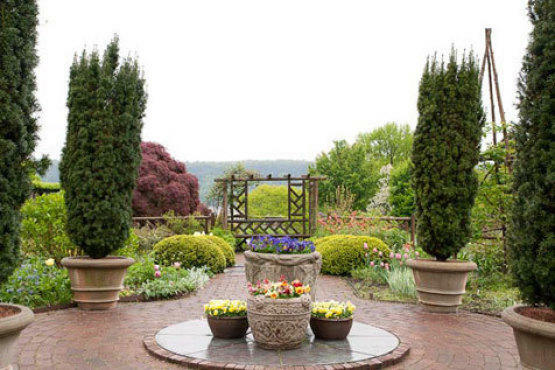 1 Much like the rest of Riverdale, the gardens at onetime private estate Wave Hill (Independence Ave at W 249th St; 718-549-3200, wavehill.org) will make you feel far removed from city life. Armed with a camera, begin your tour of the 28-acre property at the Flower Garden to view a vibrant assortment of peonies, columbines, irises and small leaf mountain lilacs. Those itching for the hot weather should head to the Marco Polo Stufano Conservatory to admire tropical flora, including cactus, anthuriums, orchids and bromeliads, but bear in mind that no blossom can take your breath away quite like the show-stealing vistas of the Hudson River and New Jersey Palisades, which are best viewed on a bench or lawn chair near the Pergola Overlook. 2 We hope you filled your digital camera with picturesque memories, because you’re about to follow the sidewalk that trails alongside the less scenic Henry Hudson Parkway. Thankfully, it doesn’t smell half as bad as it looks: The scent of wood chips used to fertilize the well-maintained gardens of the bordering homes overpowers the exhaust emitted from passing cars. You can’t miss the bright red doors of the stone, Gothic-style Riverdale Presbyterian Church (4765 Henry Hudson Pkwy between 247th and 249th Sts; 718-796-5560, riverdalepc.org), designed by architect James Renwick (you might recognize his handiwork from St. Patrick’s Cathedral). The church was built in 1863, back when Riverdale Avenue was still a dirt road and the congregation arrived by carriage or, like you today, by foot. 3 You’ll want to listen to Mom’s sage advice about looking both ways before crossing the street en route to Riverdale’s best-known landmark, Bell Tower Park (W 239th St at Henry Hudson Pkwy, nycgovparks.org)—the half-acre green space is smack dab in the center of an intersection. Crane your neck at the field- and limestone tower, which houses a nonfunctional Spanish bell that was captured during the Mexican-American War by General Winfield Scott. You can also scan the names of Riverdale, Kingsbridge and Spuyten Duyvil residents who served in World War I, listed on a bronze plaque affixed to the structure. 4 Rumor has it that the city’s most properly pulled pint of Guinness can be found at convivial Irish pub An Beal Bocht Caf (445 W 238th St between Greystone and Waldo Aves; 718-884-7127, anbealbochtcafe.com). Treat yourself to one ($6) and savor it in a quiet window nook or at the handsome brass bar, where you’ll surely be treated to some old-fashioned craic by the good-natured staff. Make sure to pop into the light-filled back room, which hosts monthly exhibits from local artists (shutterbug Sharon S. Ma’s photos are on view through Sunday 2), before you leave. 5 Now that you’ve peeped some of Riverdale’s mansions and Victorian homes, it’s time to tour the neighborhood’s most droolworthy piece of real estate: the Van Cortlandt Mansion Museum (Broadway at 246th St; 718-543-3344, historichousetrust.org; Tue--Fri 10am--3pm; Sat, Sun 11am--4pm). The manse was built by a rich merchant-farmer family in 1748, and today is the crown jewel of the 1,000-acre Van Cortlandt Park. Take a 15-minute self-guided tour ($5, free on Wednesdays) to see the museum’s collection of colonial furniture and decorative objects, some of which were used by the Van Cortlandts. Look closely at the curtains in the west bedchamber (where George Washington is said to have rested his head) and you’ll notice an artichoke pattern that was typically displayed only in wealthy homes. You probably have remnants of Artichoke pizza on the carpet of your apartment. That’s pretty much the same thing. 6 Having completed this two-mile trek, you’ve earned yourself a solid meal. Request a table in the main dining room of Jake’s Steakhouse (6031 Broadway at Post Rd; 718-581-0182, jakessteakhouse.com), which overlooks the park’s greenery of Van Cortlandt Park. Splurge on the pricey but popular T-bone steak ($36), or stick with a classic burger served on an English muffin ($18). Pair your meat with a glass of Finca La Martina ($9), an Argentine malbec, and toast to your barking dogs. Ten treks to get you out of your apartments and deep into the heart of New York City.